Kopari Aluminum-Free Deodorant I’ve tried several aluminum-free, natural deodorants and hated all of them, but I’ve been using this little guy for about a month now and I gotta say, I’m into it! This non-toxic deodorant is free of aluminum, baking soda, parabens, silicone and phthalates so you can feel good putting it on your pits. It has a very mild coconut scent and definitely keeps me feeling and smelling fresh all day. If you haven’t used a natural deodorant before I definitely recommend this, but remember that this is not an antiperspirant (i.e. no, it will not stop you from sweating). You’ll need to give your body a few days - or even a few weeks - to adjust, especially if you are coming for an antiperspirant product. That being said, I think the benefits definitely make the transition worth it. Kiehl’s Ultimate Strength Hand Salve As the cooler temps set in and the heat is comin’ on, my skin is starting to feel dry. Luckily, this salve is my secret weapon. I’ve been using it for a few years and it’s definitely the number one hand cream in my book. I keep it next to my bed so I can lather it on before bed and wake up with nice, soft hands. SunButter Natural Sunflower Butter If you’re looking for a peanut-free nut butter option - or just a delicious spread - look no further. This stuff is insanely creamy, spreadable and delicious. I like to eat it for a snack or for a quick breakfast with apples, bananas or spread on a rice cake. I.AM.GIA Pixie Coat in Red If you know me, you probably know I have a sliiiiiight jacket/coat obsession. And this red teddy coat is the newest addition to my collection. I love the sporty, casual, almost ‘90s vibe of this oversized sherpa jacket and the red color is so on point for this season. This is super cozy and looks great with jeans, leggings, dresses or anything really. GoodBelly Probiotics StraightShot I already take a tablespoon of Probiotic Coconut Water from inner-ēco each morning, but every once in a while I just feel like I need to boost my probiotic intake a bit. I like these StraightShots because they are dairy-free with 20 billion live and active probiotic cultures per serving and no sugar added. Plus, they come in individual cups so they are easy to take on-the-go. Eberjey Gisele PJ Set Eberjey hands down makes the best pJ sets. I have four and they are my favorite thing to sleep in or even just lounge in. 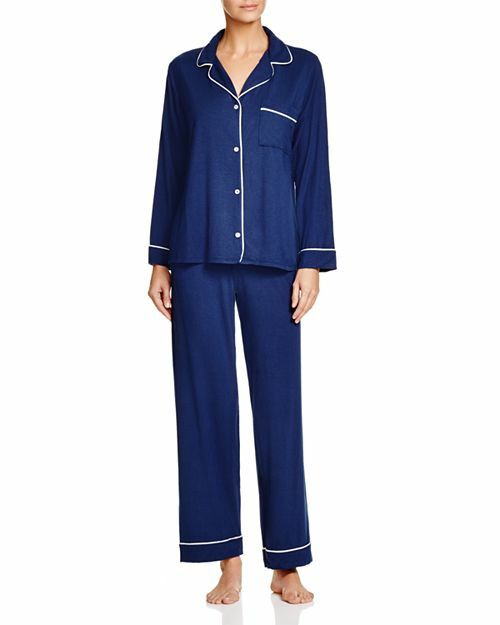 And to me fall/winter weather just makes me crave a cozy PJ set. Urban Outfitters Minimal Rope Chain Necklace This is the perfect minimal necklace that can be paired or layered with others. I’ve been wearing it with different necklaces almost daily and just love how the layered look goes with so much. Potterybarn Plaid Alphabet Mug I know it’s not even Thanksgiving, but there are less than 10 weeks left in 2018 so I think now is the time to get a little festive. And the adorable plaid letters on these mugs are like low-key festive. I’ve been drinking my morning coffee out of this every morning and it makes me happy. And at $8 a mug, these would make great gifts for the holidays. VOSS Lemon Cucumber Sparkling Water My mom got me hooked on this and although I feel a little silly buying such boujee sparkling water, the lemon cucumber flavor really is good. I’m not the best at drinking water throughout the day so when I find a flavored water that I like, I feel as though the price is worth it. After all, hydration is important, kids. Leave No Trace Not only the best movie I saw this month, but easily one of the best I’ve seen all year. The entire film is so well done and Ben Foster delivers such a powerful performance. I’m predicting Oscar nominations for this one.